"...Prolific North Carolina writer and cult cinema advocate John Kenneth Muir is a good 18 steps above the usual dubious faux scholar/blogger. 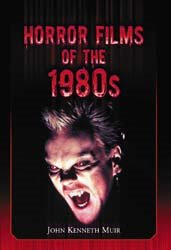 His books have laid the groundwork for a future academic canon on horror auteurs such as John Carpenter and Tobe Hooper. It isn't just that he loves even the lowliest obscure grindhouse relic. He takes enormous time and effort analysing, unmercifully yet attuned to heretofore dismissed value, every release he turns his attention to..."
"...Eloquent examinations of both acknowledged greats like Carpenter's The Thing and Cronenberg's The Fly as well as lesser known gems such as Kathryn Bigelow's Near Dark and Thom Eberhardt's Night of the Comet are finally as thoughtful as these films deserve..."